I wanted to share these photos with you . They are soooooo pretty. I can’t tell you how much we love these dogs. They are very different in personality but they complement each other beautifully. You were spot on right with Starr(cotton) she is a clown! So sweet too. You were also right about the male being affectionate, he is very sweet and loving. He is more protective than she is as far as strangers and other dogs . They are both doing great and are so much fun. We are planning to get her spayed in January. 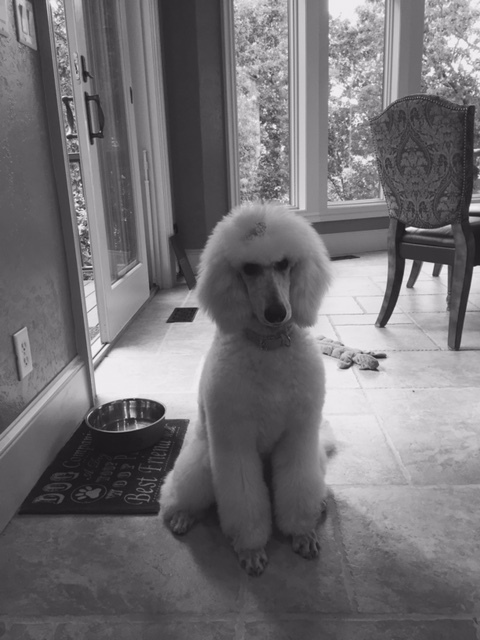 Anyhow I hope you and your poodles are doing well! 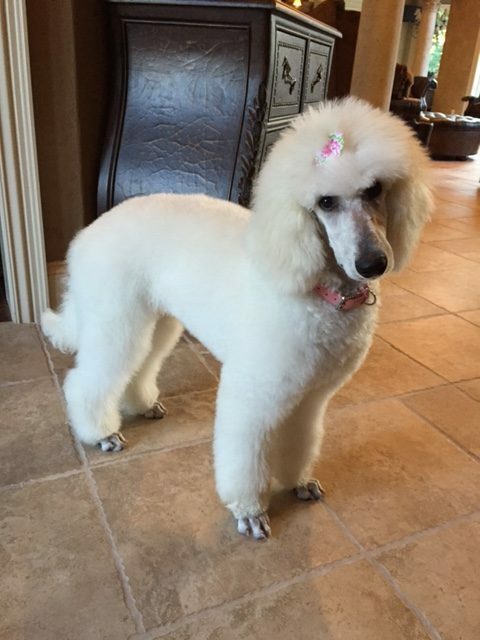 We could not have been more pleased with our experience with Poodle Mojo, far exceeded our expectations. So I yam all grown up now! 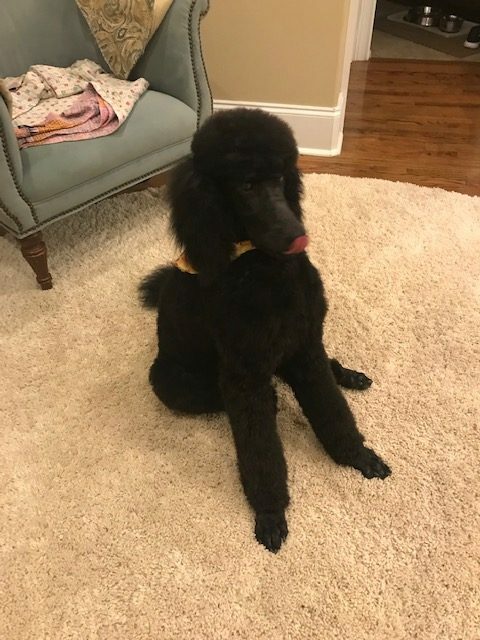 It has been such a great experience and our poodle is such a good fit for our family we have decided to purchase a second poodle very soon. 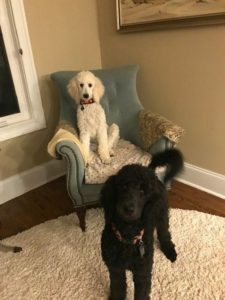 I feel very comfortable with my decision to purchase a PoodleMojo pup! Any questions I have encountered were always met with a patient, caring, prompt response based on many years of experience. He’s a joy to have and we love having him as part of our family. Thanks! What a bundle of energy; he loves playing outdoors and it helps lower his indoor energy levels. He’s doing great in the house and outside. 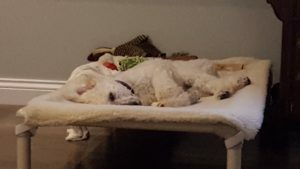 He naps sometimes in the crate now even though we got him a nice Kuranda bed. Ginny is doing just great and we are loving her so much!! 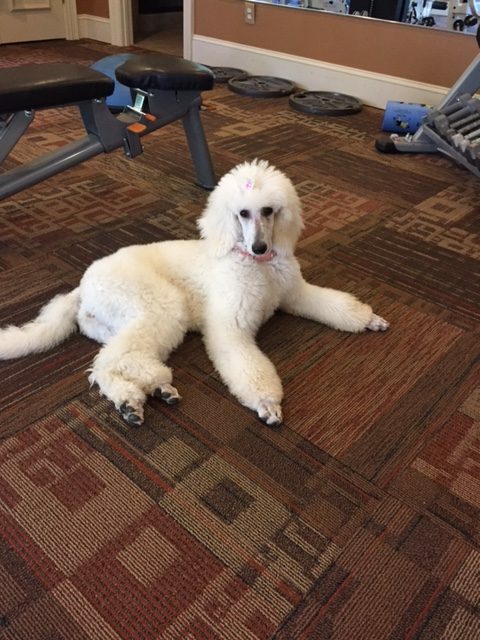 We have recently been in a puppy training class with her and, of course, she is by far the smartest dog in the bunch. That doesn’t mean that she will always obey but we are working on that! Just wanted to tell you about our recent lunch outing in Boone, NC, in the mountains. Bill and I were sitting outside having lunch. We had Ginny with us. Of course, everybody who came by us had to stop and pet Ginny, who was perfectly behaved. Then a woman stopped to talk about Ginny. 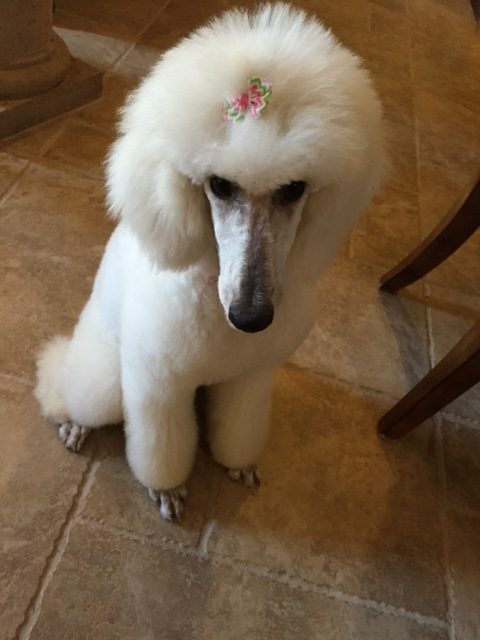 This woman had raised standard poodles in Florida for show. 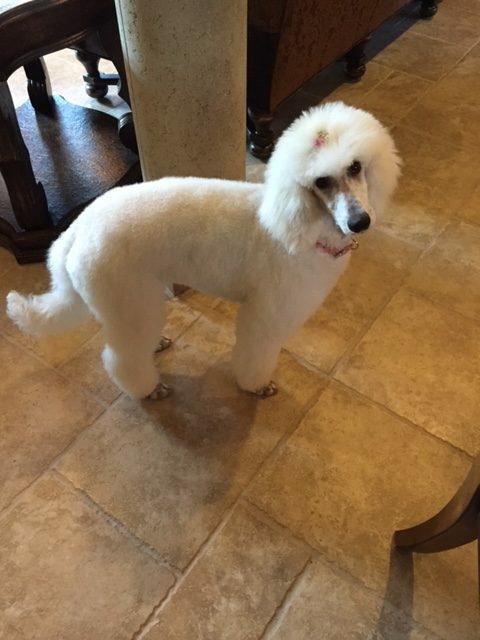 She remarked that Ginny looks like a show dog and asked if we showed her. I explained that Ginny is a family pet but that she is registered. Anyway, don’t be surprised if one day we send a buyer your way. Ginny is a star!! She is the most precious thing I have ever laid my eyes on!!! I seriously could squeeze her ALL day long! 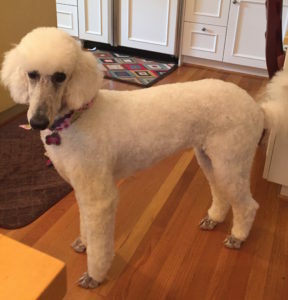 We have never been so in love with our new little baby, Fifi, the Standard Poodle! She is the light of our lives! 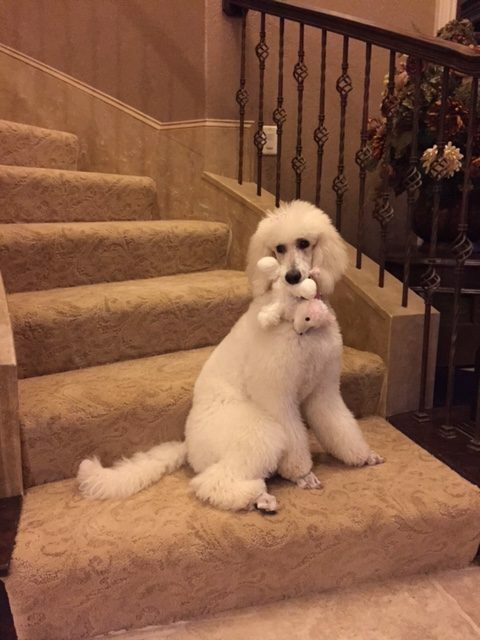 Fifi was trained when we got her, thanks to our amazing Breeder and Trainer, Jully. She is so patient and kind, answering any and all questions I may have about my new puppy. 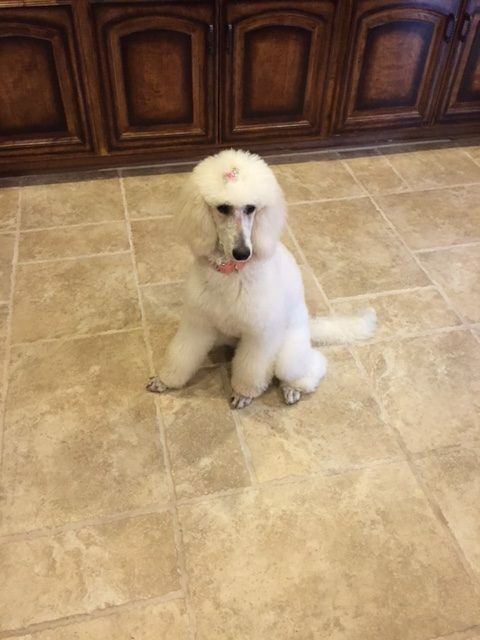 She starts her puppies out with an amazing diet and supplement, which we firmly believe will contribute to having a healthy and happy Poodle. 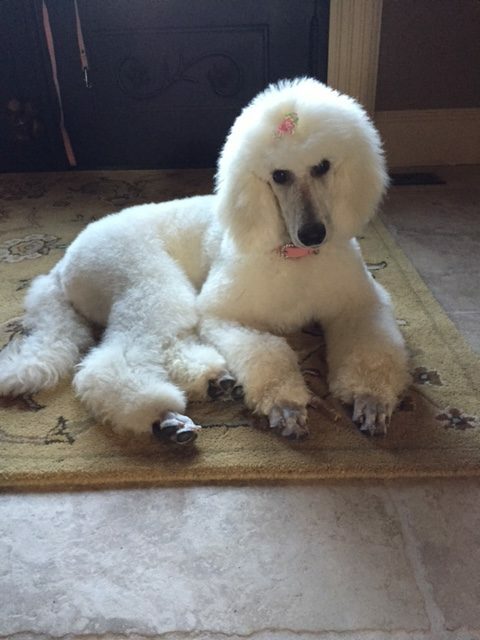 We will continue to keep our Poodle on the same dry food (Life’s Abundance) forever, as we did our research on it and it’s the best out there! 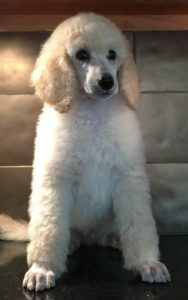 We honestly can’t say enough positive things about our experience with everything in getting our new puppy through Poodle Mojo. Fifi is truly a beautiful and intelligent baby and sweet as can be! 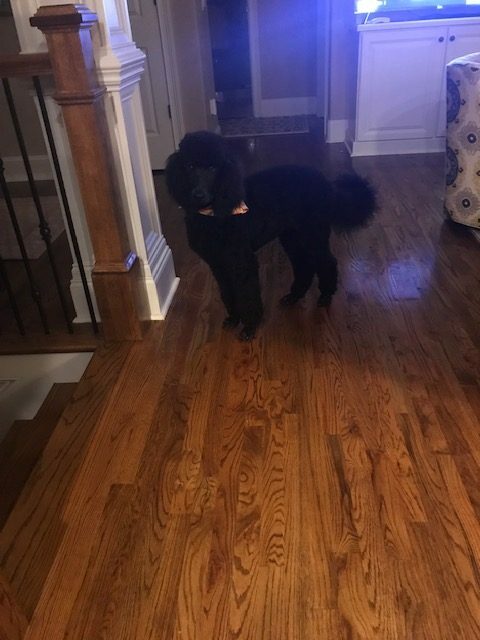 Amazing temperament, her gait is wonderful, and she has been so easy to train. We will definitely be buying a “second” Standard Poodle from Poodle Mojo very soon, as we have come to realize this breed is highly addictive! Lol! 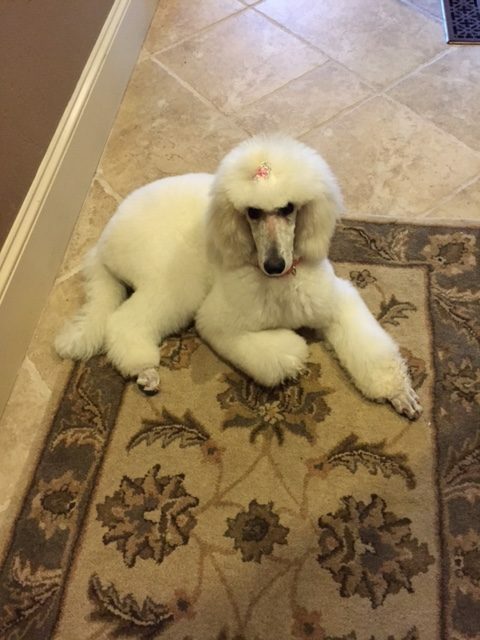 Thank you Jully, for being such a wonderful Breeder and Trainer and being so honest with everything. You are one in a million! Kristoff, now known as Wrigley. 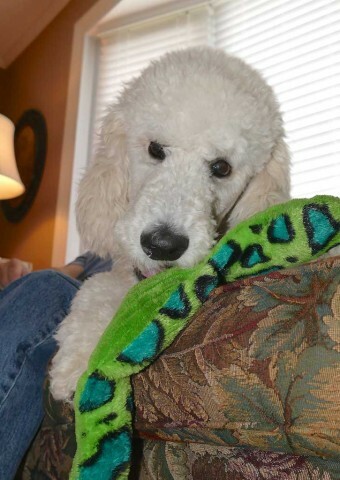 Hi Jully, just letting you know that little Wrigley is doing GREAT. We couldn’t be happier with him! He has adjusted well to his new environment and is learning quickly. He is doing well with housebreaking… he isn’t perfect yet but he understands what ‘outside’ and ‘potty’ mean. 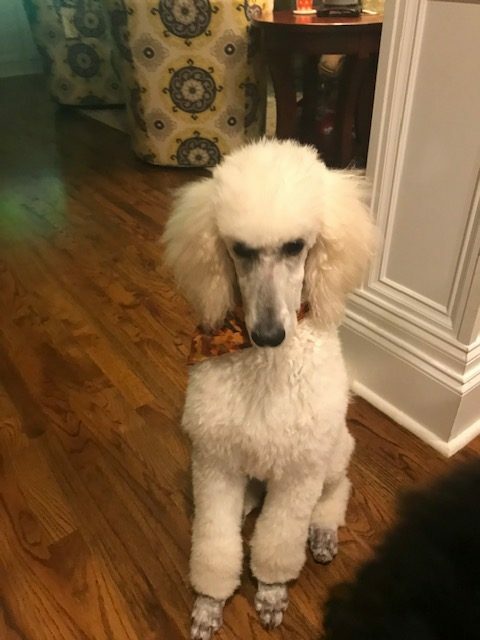 He is great with my clients – greats them happily then goes to his place (and stays) and entertains himself with a bone or toy. Super smart! He is a little piglet – likes his meals! He sleeps all night in his crate and doesn’t even cry when we put him to bed anymore. He does wet in the crate…. but I’m sure that will stop once he has a little more control…. Again thank you so much…. and we just love this guy to death.